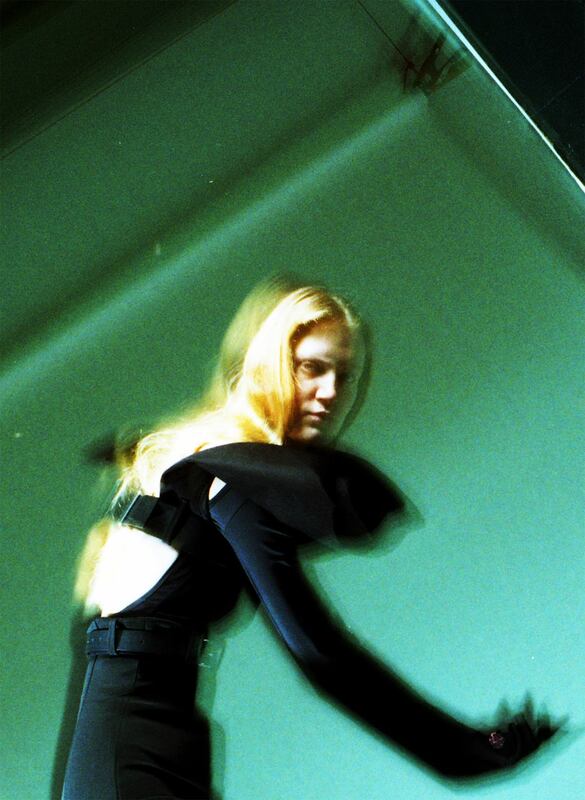 Arturo Obegero is one of the rising stars from this year’s MA Fashion course at London’s Central Saint Martins. Translating his Spanish heritage through Flamenco dance in his graduate collection, the young designer celebrates the darkness and furious expression of sorrow and death as the purest and most cheerful expression of love and life. With an exquisite elegance and unrivalled sensuality, Obegero seduces the spectator with his theatrical creations. TEETH sat down to talk about his creative process, points of reference and work with photographer Sangwha Yim. Desislava Todorova: What was the inspiration for your collection? Arturo Obegero: In my collection, you can find structured volumes inspired by the couture of Cristóbal Balenciaga, one of my most important references, combined with pieces that fit the body like a second skin. Reinterpretations of Torero’s trousers that grow until mysteriously covering the face, high-waist trousers with chiffon trails that gracefully move with the air, which cut is inspired by one dress of my grandmother’s Palmira (also name of the collection). Dresses with capes that extend until the fingers of the models and dancing tops with glove/cuff hybrids incorporated. All in black as a homage to my grandfather Pedro Obegero. What’s the defining element in your aesthetics? If I had to summarise my collection and my aesthetics into words, they would be sensuality, severity, rigour, elegance, and one of my favourite Spanish words, Porte. What were the obstacles in executing it? I would say that the actual making process was the hardest obstacle for me as my pieces are technically quite complex and they require precise hands and an extensive amount of time cutting and sewing. However, I had the help of amazing friends such as Olivia Suguri and Sara Kiani, whose help saved my life so many times. Apart from that, time management was a substantial obstacle during the development of this collection. The CSM MA path is so intense, you basically have lineups every week where they expect quality and quantity, and at the end, you only have a week to modify and fix all the mistakes or even to remake new pieces. On the other hand, one of the strongest obstacles I had during this year was editing. There was always a constant flow of ideas, whether it was research, shapes, textiles, and details. However, I really learned how to edit myself this year, and I am looking forward to the future and all the things I will be able to develop from all of these. In what way did your cultural background influence you during the creation process? I grew up in a really small village in northern Spain called Tapia de Casariego, and I was raised in a matriarchal family where the sense of belonging and support was really important. My family, for me, is critical in all the aspects of my life, whether it is creatively or personally, as they made me who I am today. Even if it was just in the superficial details; cuffs inspired by my grandfather’s Pedro shirts, dresses and trousers based on my grandmother’s Palmira dresses or styling ideas out of my mother’s Covadonga young pictures. I did it as a homage because I am really proud of where I come from. I also used this project as a tool to liberate and even translate myself into clothes, and I strongly believe that Flamenco really represents me, as it’s powerful and rigorous but also extremely sensitive. My pieces are graphic, severe and sleek but they also distort, abstract and hide the body and I think that explains who I am. What would be the soundtrack to it? As I commented before, I strongly consider Flamenco to be one of the most powerful traditions we have in Spain. It’s a music and a dance created by the people for the people. The depth, the meaning, the history and the soul it has is so captivating which makes it even more irresistible and attractive apart from superficial levels. Flamenco with its movements and music is one of the most precise artistic representations of life ever, as it belongs and talks to the people. Its ambiguous dancers narrate beautiful stories together with the sound of the guitars, the clapping, the boxes, and even the shouting from the people. It’s pure energy. It expresses fury and sensitivity at the same time; it expresses sensuality with anger or happiness with severity. It’s so exquisite in all its forms that when you listen to it, you feel something moving inside you like you want to belong to that beautiful world. The music is mixed by my visual collaborator, Sangwha Yim, who combined traditional Flamenco sounds with wind blowing which represents the emotional tension between male and female. What was the visual message you wanted to transmit in your work with Sangwha? Working with Sangwha was a dream. She was extremely patient and understanding with me, as sometimes I can be really stubborn. However, from the very first moment, she recognised who I am, and who my man and woman are. I remember I messaged her and two or three days later we were already working on it. I provided her with some video references from my favourite Flamenco dancers, and she literally chose my favourite one. The film is an old movie in black and white where you can see Antonio Gades, my dancing idol, slowly and elegantly moving and creating beautiful lines with his silhouette, with really subtle and romantic Spanish guitar music in the background. She perfectly captured the mood, and she was able to translate and portray all these values and words that I always talk about to define my work. She was able to merge them with her own creative vision, which is extremely sensitive, abstract and contemporary but with strong classic and elegant elements. I consider that was the primary visual message we both wanted to communicate – a film that would express the combination of both of our worlds and visions. The principal direction in the creative process was playing with the abstraction of the body, with revealing and hiding, creating beautiful and graphic scenes where the models even merge into one, generating a sensuous ambiguity and a severe romanticism. Follow and stay up-to-date with Arturo Obegero’s journey through his Instagram.